Several years ago I decided that I would go on an African Cape buffalo and plains game safari, although up to then, the only animal I had ever shot was a bullfrog when I was 10 years old... at least it was a "bull"! I am living proof that an inexperienced hunter can, with luck, research, practice, and preparation, have a very successful African hunt. After saving up for a few years my wife and I were on our way to Victoria Falls, Zimbabwe. She had heard for at least a couple of years that I would of course be killed by a Cape buffalo and that no one in their right mind would go on a dangerous game hunt as their first African safari, let alone their first hunt of any kind! She was nervous to say the least and worried about our four potential orphans. We had just finished taking my Cape buffalo to the skinning shed early that morning and about 9 o'clock were out after eland or whatever other game we might happen to run across. My PH, Darren, had a feeling we would find eland in a particular place he knew of in Matetsi Unit 2, and that is just what happened. Since I was the only hunter on Unit 2 we had the run of the place. As we drove down the trail, one of the trackers ("Lovemore") saw a herd of eland far up on the ridge to our right. We then proceeded to gear up and prepare for the stalk. After stalking the herd for quite some time, we covered the final two hundred yards on hands and knees and/or our rear ends through the tall grass; at the time I did not think about snakes, or God-forbid spiders. Darren set up the shooting sticks on the reverse slope of a small hill so that only our heads and shoulders would be visible to the eland. The herd, which numbered about 20 animals of all ages and sizes, was across a small valley in a very thick grove of mopane trees. As they say, the big ones look big, and the largest bull looked very large even from 250 yards away. It was clear to Darren that the bull had exceptional horns that were not at all broomed down. We waited quite some time for him to come clear of various cows and calves which (as many of you know) have a tendency to prefer to browse directly between the hunters and any bulls. Darren told me to take him as soon as he cleared a line of bushes he was partially hidden by as he slowly made his way from our left to our right. I thought that I would have to hold about four inches high at that distance with the .375 H&H. Naturally, just as he was about to step into the clear, he reversed course and walked downhill deep into the mopane grove directly away from us. We then retreated back down the hill we were on, and Darren and the trackers had a strategy conference. Apparently, we were going to try to outflank the herd, although by now the eland were nowhere in sight. After a walk of perhaps a half hour, I suddenly noticed that Darren and the tracker had come to a stop and in fact were standing motionless in a group of about six very small mopane trees. I nearly bumped into the tracker as I had been walking with my head down and eyes on his feet, mostly to keep from stepping on something noisy like a stick or something pointy like a puff adder or cobra. of the corner of my eye, and just there to my left walking up the trail we had just crossed, was an eland coming more or less directly toward us. I then saw that this was a cow or a young bull since the horns were pretty thin, but being that close I realized that even cows or young bulls are large animals. As it turns out it was a cow and she continued in our direction and ended up walking less than five yards behind us. It was all we could do to not turn and look at her when she stumbled on a rock or a log; it sounded like she almost fell down. How she managed to walk right behind us and not see or scent us was a mystery to all of us. Anyway, while the cow was walking up to and then behind us, we then heard that funny clicking sound of the bull’s hooves as he followed her up the trail. Lo and behold, the huge bull from the earlier stalk was following the cow and was walking directly toward us as well! Well, from the moment he saw the horns as the bull came up the inclined trail, Darren was whispering to me to "Shoot this bull!" with ever increasing urgency and stress in his voice. Darren had the shooting sticks I had practiced with and used on the buffalo, but he was at least 15 feet away from me. There was no way we could change positions at that point. He was no doubt expecting and hoping that I would take the frontal shot from 30 yards or so. As the bull continued walking toward us, I slowly, very slowly raised the rifle and braced it against the tiny tree I was standing next to. I used a convenient little twig as a rifle rest which fortunately did not snap off the tree. Somehow I managed to remember to take off the safety and raised the rifle without spooking the bull. Now all this time Darren was stage whispering over and over, "Shoot this bull, shoot this bull, shoot him, shoot NOW!!!!" and I’m sure trying very hard not to shout at me. Like the inexperienced hunter that I am, I was waiting for the bull to present the perfect broadside shot, which he finally did. Darren said the bull finally saw us just as I shot him in the shoulder at 20 paces with the 300 grain Swift A-Frame. I think Darren would have shot me if the bull had spooked and run off with that unique, never-ending gait they have! The bull was so close to us it was simply amazing... in fact it was hard to see anything through the scope except an expanse of that blue hide. But, as with the rest of my safari, I was blessed with good luck and the bull fell to the shot and could not get back on his feet. It was amazing how such a large animal was actually knocked down by one bullet as if he was hit by lightning. He was such a large animal that even at 20 yards, the Swift A-Frame did not exit the offside shoulder. Certainly, the Cape buffalo had a different reaction to being shot with a .470 Nitro Express since he had just run off with his fellow dagga boys for a couple of miles. Darren told me in all his years as a PH, he had never heard of anyone shooting an eland at 20 yards; 200 yards was generally as close as anyone could get. I am sure I would have missed him at that distance. As it turned out, my eland stalk was without a doubt the best hunt of my ten day safari; he was a magnificent animal and truly the trophy of a life time. For the next eight days after this performance, the trackers called me "old man who takes too long" which I think actually was something like "old man who eats time" in N’debele. Great story, and I believe that you will always remember that hunt! 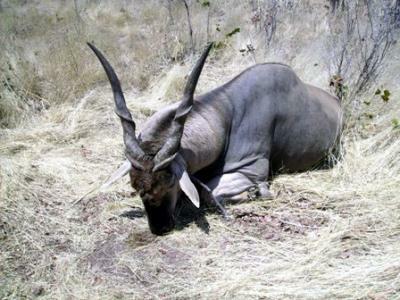 Thank you for a great Eland hunting story. I am going after Eland next year and hope to get a 40 incher like yours. Your African name is wonderful. The photo could have been better, with you in it. This story was hard to read. It didn't hold my interest as well as the other stories I've read. A very interesting story. Very detailed and informative. Easy to read. I enjoyed it.